How Long Does it Take to Make $1000 Online? This fall, without much fanfare (other than this post), I finally made $1000 online. Cash money, in my bank account, via direct deposit or mailed check. I did this without signing up for any scammy or spammy “MAKE MONEY ONLINE NOW” schemes. I didn't buy backlinks or focus on crazy SEO tactics that are only going to be invalidated in the next iteration of Google Penguin/Panda updates. I only had 44 Twitter followers at the time and I was convinced many of my 200 Facebook followers were fake accounts. My Alexa ranking had never been below 1,000,000, as far as I know. I know this isn't that impressive. There are bloggers and website owners out there who make this in a day. However, most of these folks blog full time or dedicate many more hours of their day to promoting their sites, publishing guest posts, and writing great content. I don't have the time, energy, or motivation to dedicate myself to blogging like that. There are so many other things to do with my limited free time, places to explore, people to meet, beer to drink, and experiences to be had that I can't sit at my computer screen for hours every day. If I find a topic for a post I'm passionate about, I'll write about it. I can't make another “10 Ways to Save Money By Drinking Your Own Pee!” post. You know those sites I'm talking about. There is plenty of noise out there on the internet. I'm not going to contribute to it. Plus, I have my day job with Uncle Sam, which can be a 168 hour a week job at times. I'm excited to have made this money online while serving on active duty. It can be nearly impossible for active duty servicemembers to generate income through a second job or side hustle because of the frequency they travel and the hours they work. That said, if you want to achieve financial independence sooner rather than later, increasing your income is the quickest path. You can only cut your expenses so much. You still need to buy food. You still need to buy clothes. You still need to put a roof over your family's head and have fun with life. Rather than saving a few pennies every day, why not make a few more dollars every day? And, while you're at it, you can help other military personnel to achieve their financial goals, even if it isn't early retirement (although who wouldn't want to be done working at age 40?). That's why I got into this game. How Many Hours Per Day Does it Take to Make Money Online? In terms of time invested, it depends whether I'm deployed or at home. When I'm home, I probably spend about 5 hours a week doing blog content related activities (social media promotion, actually writing posts, finding ideas, managing the comments and backend WordPress stuff, etc.). I'm on the road so often that I feel like I need to maximize my time with family and friends when I'm home. Blogging definitely becomes a lower priority. When I'm deployed, I find myself investing more time and energy into the blog. If you look back at my archives, you can probably tell the months I was deployed, because I cranked out about two posts a week. This probably required around 10-20 hours of work a week. Nearly a part time job! Most of my traffic came from Google searches. Hopefully I helped some of those people who were looking to see whether Lending Club was a scam (it's not), find more information on the USAA Career Starter Loan (here), or see if Time Warner Cable offered a military discount (they don't, but you can still get a discount if you call!). I am paid by a well established and legitimate advertising program: Google Adsense. Adsense is backed by the $280 billion online search juggernaut Google. In exchange for a few lines of code on my site that displays advertisements, I get a check every month from the Big G for over $100. I started this blog on April 1, 2012. By Sep 16, 2013, I had earned $1001.60 from Google Adsense. 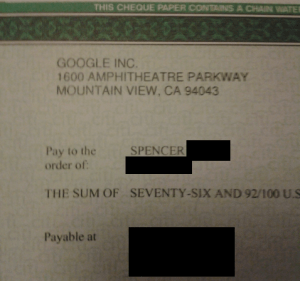 My first Google Adsense check! It took me about 1 year and 6 months or 563 days to go from earning nothing online to earn a total of $1001 and earning $100+ per month consistently. $1000/563 days = about $2 per day. Not exactly Pat Flynn levels of income (he averages around $50,000 per month). Obviously, at $2 per day there is a lot of room for improvement. But just think about how incredible it is that you can be paid for just publishing some words on the Internet. I find it pretty darn amazing. My Air Force job sometimes requires me to be away from home for 3 weeks with 2 days of notice. Sometimes I don't have an internet connection for a week. Sometimes I have literally worked a 24 hour day, slept for 12 hours, and then gone out and worked another 24 hour day. I have slept in 8 separate countries on 4 different continents in the space of 2 weeks. My job does not allow for any kind of side hustle or work where I need to be somewhere at a certain time. But blogging doesn't require that. Plus, I enjoy writing about subjects I care about. Blogging provides me with a far greater audience than just my friends and family. And no one wants to listen to someone go on for hours about military personal finance, early retirement, or financial independence. Trust me. When I go on those 3 week trips and don't have a spare second to write anything for the blog, it brings a huge smile to my face to open up Google Adsense and see that I still made money. A little bit of work up front results in a long term pay off. That's the best part of earning income online. Creating time and location independence for yourself. Even if it's only a few dollars a day. Congrats man, we haven’t yet made it to the $1000 mark with our blog, but we are trying. Thanks for listing the amount of time you are spending on your blog, we need to step up our commitment if we want to make money. It’s a bit depressing when you consider your dollar/hour rate, but I’d say the first $1000 is the hardest. On to the next $1000! Also enjoyed your guest post over at Pauline’s site. Thanks man, just checked out your site, I liked the rant about wealth seminars. It’s true there’s a sucker born every minute, but there’s always someone born every minute to take advantage of that sucker. Adsense is not only the only way to make money. Dont you accept Sponsored posts? I think you can make easy 100 USD with one post. If you are earning 100 USD per month, its good, however with time I think the amount will surely increase. I’m not very interested in sponsored posts at this time. I like to write about what I want to write about, not someone else.